Welcome to Day 27 of the 31 Days of iOS. Yesterday, we started a two part series on Push Notifications. Yesterday was all about getting things set up. For push notifications getting set up is a particularly complex matter. Provided you had no issues with yesterday though, you should be ready to continue on and actually code and test your push notifications. One VERY IMPORTANT thing I’d like to point out is that you NEED to be a registered iOS developer in order to follow along today. There are steps you can’t take (like moving the app to a device) unless you are. Also, you can’t test push notifications on the simulator, you’ll need to have an iOS device in order to test this out. We won’t be doing any coding today as there is a lengthy set up process we need to go through first involving the Apple developer portal. Tomorrow we’ll implement all of the code and actually test out our push notifications. We’ll be starting with a brand new project, but if you’d like to follow along with the completed code, you can access it here. Now we can switch over to the AppDelegate. This brings up a very important caveat to push notifications: users DON’T have to allow push notifications for your app. That means that they can install your app and allow push notifications or not. You don’t really have any control over it. Make sure your app is designed in such a way that if push notifications aren’t working, or aren’t allowed, your app will still function. Now regardless of if the user taps Don’t Allow or OK they’ll continue on to your app. However, behind the scenes something is happening. First, the user’s choice is being saved in the Notification options under the Settings app (we’ll look more at this later). Second, if they did hit OK to allow push notifications, the device is communicating with the APNS servers to get a device token. When we run our app now, we print out a token that looks like this: <867ee0d4 9b979be4 bd5e7155 57900f38 6d2d366f 1ff9263f bb26cb76 4254f483>. To you and me that is a meaningless string of numbers and letters. However, APNS can use it to direct a message back to your device. The next step would be to do something with that token. Normally, this is where we would want to send our push notification to a server for saving so that the server could then use the token to send a message to our device. Since we’re less concerned with the server implementation today, we’re going to skip this part. Later on, once we’re finished with the app side, we will test a push by manually pulling the token that is getting logged out and using it. Now we need to do some app settings changes. 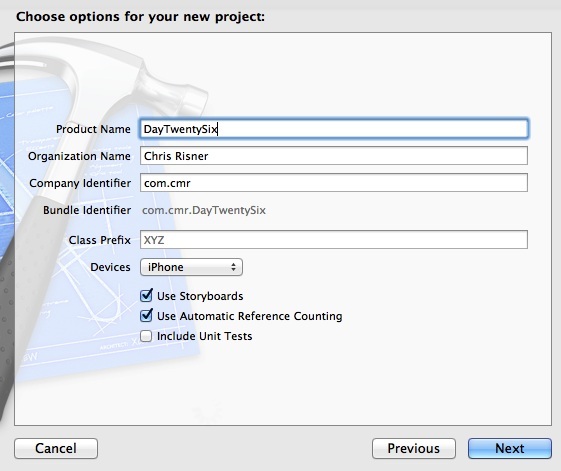 Here I’ll select the drop down next to Code Signing Identity and choose the one I created yesterday: Day Twenty Six Push. If you have multiple profiles available, notice that you can only choose ones that are set up with the wildcard (such as the team provisioning profile) or ones that specifically match your app’s bundle identifier. 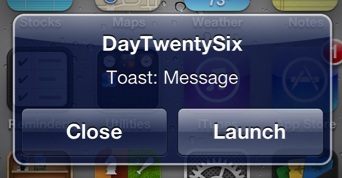 Now we can test out sending a push notification. Those steps aren’t complicated but outside the scope and focus of this article. 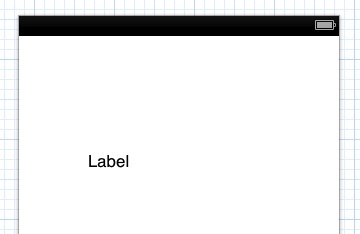 It would be up to me to inspect the data that came over and figure out what I wanted to do from within my app. Let’s take a look and see what happens if our app isn’t in the foreground when we receive the push. This is very common with messaging apps as a way of indicating how many unread messages the user has. Other data fields you can send over include sound if you want to play a sound file, payload if you just want to send over some form of data, and expiry. The Way expiry works is that it specifies what date and time your message should no longer be delivered on. If the device is off or not receiving a signal, a push notification can’t be delivered at that time. APNS will continue to try though. However, some push notifications may be time sensitive and you may not want to deliver them past a certain time. For example, if I was building a deal-a-day app (like Groupon) and I was delivering an alert notification each day to tell you about that day’s deal, I probably wouldn’t want to tell you about yesterday’s deal if you just turned your phone on today. You can use expiry to make sure that doesn’t happen. If you launch the Settings application from the home screen and go to the Notifications area, you can edit how push notifications are handled for each application. 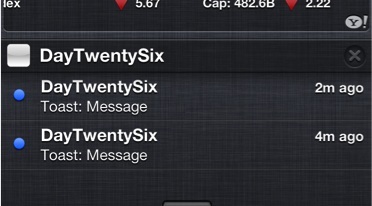 You can choose whether or not to show things for the app in the Notification Center and if so, how many. 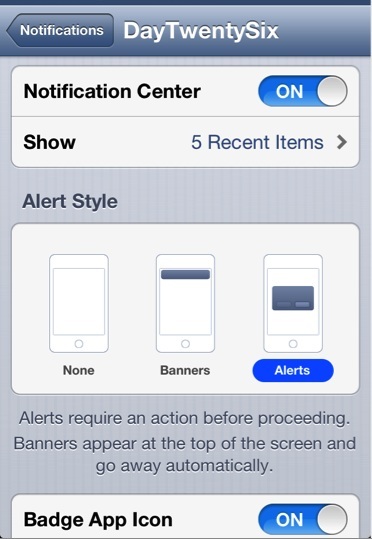 You can change the Alert Style from banner, to normal alert, or nothing. 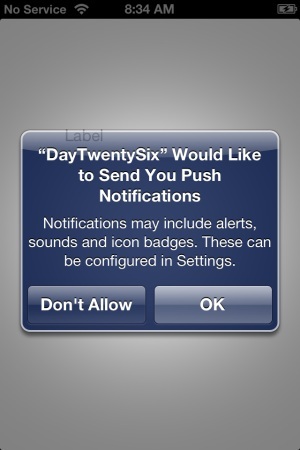 You can also choose whether badges or sounds work as well as if alerts should be visible from the lock screen. Remember that every user has access to this and can turn on and off push notifications for your app. Make sure your app is capable of handling things with no push notifications allowed. There are a few other server side considerations you should be aware of. First, when we set up our certificates and profiles yesterday, we did it for the developer version. You’ll need to go through the same steps again to create a production version of those things. Additionally, the p12 file you end up with is used to sign all of your requests for push notifications so whatever server is doing that for you (in my case, Windows Azure Mobile Services), will need to have that uploaded to it. Additionally, those certs you get for pushing expire after a year, so keep the date in mind so you can generate new certs before your old ones expire. Lastly, the tokens you get on your device and then send to the server can expire or be marked invalid by APNS. Fortunately, APNS will tell your server that they have expired so you can stop trying to send to them. 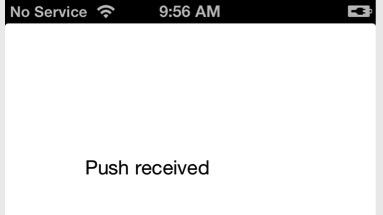 Today we went through all the code necessary for push notifications with APNS. Additionally, we looked at the different kinds of notifications you can receive on the client as well as how they can be turned on and off by users. We touched on the server side without getting our hands too dirty there. You should now have a good understanding of how push notifications work with iOS and how you can implement them yourself. You can download the completed code from today’s walkthrough here (remember it will be named Day Twenty Six).